While no one looks forward to filing their taxes, there is a silver lining. Businesses all around offer Tax Day freebies and deals to ease the sting of the dreaded day. This year, there are deals from restaurants all across the city. Check out our full rundown of the best Tax Day freebies and deals of 2019. The Dollarita is back just in time for Tax Day. All throughout the month of April, enjoy $1 Strawberry Dollaritas with a Twizzler straw at Applebee’s restaurants nationwide. Get 50% off Large Deep Dish or Tavern-Cut Pizzas today with this Tax Day deal at BJ’s. Guests can order a $10.40 Tax Day Meal Special at Boston Market. Offer includes a Half Chicken Individual Meal with two sides, cornbread, a regular fountain beverage and a cookie. Order a BurgerFi Cheeseburger through the restaurant’s app for just $4.15 today for Tax Day. Enjoy an adult buffet today at CiCi’s for $4.15. Get two entrees for $10.40 today through Wednesday with this Tax Day deal. 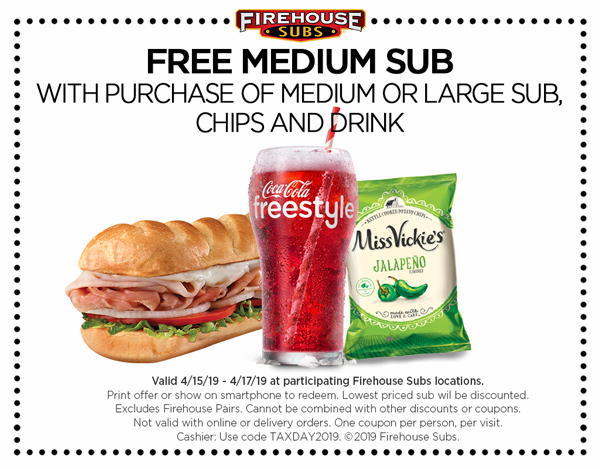 Get a free medium sub when you purchase a medium or large sub, chips, and a drink. You can use this printable coupon or if you order online, use promo code TAXDAY2019. Folks can get a free Chocolate Chip Cookie at Great American Cookies April 15, thanks to its Tax Day promotion. No purchase is necessary — or proof of taxes filed! Limit one free cookie per customer. Get a 16-inch traditional cheese pizza for $10.40 at any Grimaldi’s location on April 15, while supplies last. At participating locations across the country, you can get one free Original Turkey or Veggie Dog this Tax Day April 15.
Who doesn’t love shaved ice? Get a free shaved ice on what the truck calls “National Chill Out Day” this Monday. Rewards members can save $4 off any $10 online order at Noodles & Company. This is valid April 10-April 15. Get a free entree when you buy another and mention that it’s Tax Day. With this tax day freebie, on April 15 only you can get a free small The Original sandwich with purchase of a medium drink and chips. No coupon required. Are there any other Tax Day freebies and deals you know about? Share your favorite specials by commenting below!